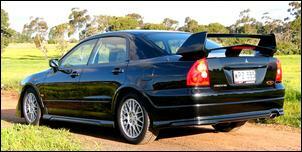 We know what you're thinking: haven't we already done a test - a lukewarm test - of the Mitsubishi Ralliart Magna? Yes you're right, but the bigwigs at Mitsubishi Australia reckon we gave their 5-speed manual mean machine a bad rap so they've sent an automatic version our way. First, though, let's revisit what we said in our earlier test of the Ralliart Magna manual; "fundamentally, the manual Ralliart's chassis simply can't handle the power and torque. Gone is the sweet and nimble around-town VR-X, where too much throttle simply spun up one wheel while the car otherwise stayed unfussed. In its place is a darty, wheel-wrenching car which - especially in first and second gears - can get away from you in the blink of an eye. Have one wheel on a damp patch of road, the other on dry bitumen and apply even half-throttle and unless you're holding the wheel firmly, the car will dash off sideways. Even in second gear you need to keep a good hold on proceedings..."
In contrast to this, the 5-speed Sports-mode automatic Ralliart Magna is a vastly more refined and user-friendly machine. 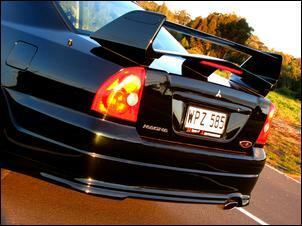 Stand on the throttle of the Ralliart AT and it never fails to track in more-or-less a straight line. Sure, a tyre will more than easily arc up, but the traction control system (standard on the auto Ralliart Magna only) effectively quells this and lets you get on with business. In wet weather conditions, though, the traction control system is working overtime and - as a result - the car struggles to accelerate cleanly and swiftly out of a corner. So why do the manual and auto Ralliart Magnas drive like chalk and cheese, you ask? It's important to realise the major differences between the two cars in driveline layout. The manual gearbox version comes standard with a torque-sensing front LSD, while the Sports-mode auto uses just the standard open-centre diff aided by TRC (Mitsubishi speak for Traction and Trace Control). In essence, the philosophy of the manual/LSD driveline is to utilise every Newton Metre trounced out by the tuned 24-valve 3.5-litre six. The idea behind the auto/traction control combination is to limit engine torque to suit the available tyre adhesion. Rather than devise an all-new front LSD, the Ralliart Magna manual uses the torque-sensing limited slip diff swiped from the Japanese market Mitsubishi FTO MIVEC V6 coupe. The top-of-the-range FTO in Japan has a 2-litre MIVEC V6 engine listed at 150kW at a sky-high 7500 rpm and a modest 200Nm at 6000 rpm. 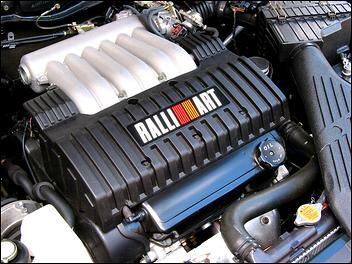 Being a relatively small displacement MIVEC (Mitsubishi Innovative Valve and Lift Electronic Control System) engine, torque is delivered very gradually; there isn't the instant gob-full of torque that the Ralliart V6 engine can dish out. Despite this difference - and without having tested any other LSDs - the Ralliart Magna manual employs this differential in completely unchanged form. 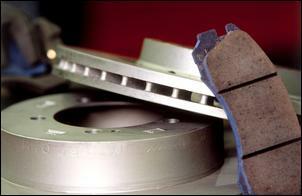 It is said to enable "more powerful traction in response to accelerator fluctuations compared to a speed-sensitive viscous coupling type LSD, superior response to accelerator fluctuations compared to regular mechanical LSDs and maintains drive even if one wheel experiences significant loss of traction". The LSD mechanism can also allow up to 2.5:1 left-to-right torque split ratio. And why can't the manual/LSD combo be further equipped with traction control, you ask? Calibration issues, we're told. Not surprisingly, Ralliart Magna's computer-controlled 5-speed Sports-mode transmission has been extensively recalibrated to suit the torque characteristics of the upgraded engine. This has included increasing the upshift and wide-open throttle downshift rpm while driving in auto-mode. Also, the manual-mode maximum downshift rpm was increased, the minimum upshift rpm was reduced, and power upshifts and kick-downs have been sharpened. Interestingly, the crew at MMAL have made no changes to the traction control calibration, which is carried over from the Magna VR-X - rest assured, it still does the job very effectively though. 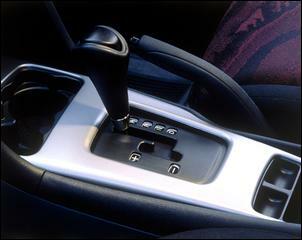 Furthermore, no changes were made to the ratios of the VR-X's 5-speed automatic transmission or final drive. In comparison to the Ralliart Magna manual - which, of course, has the same number of gears - the auto has about 10 percent shorter total gearing in first, with the remaining four ratios only about 5 percent shorter. In absolute terms, though, the manual Ralliart Magna is quicker than the auto machine - both around corners and in a straight-line. Thanks to the manual car's superior throttle control and the absolute level of grip afforded by its LSD, it will charge through a series of twisties quicker than the auto - the biggest difference is it'll power its way out of a corner. Still, the manual trans Ralliart is the sort of car you've got to be completely 'on top of' all the time - you need to hold tightly onto the wheel and get your elbows ready for some juggling. The auto version behaves very differently - relatively speaking, you can relax behind the wheel and, depending on conditions, you'll be trailing the manual car by only a modest margin. 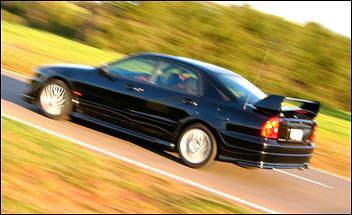 The only frustration is a lack of traction under hard, low speed acceleration. 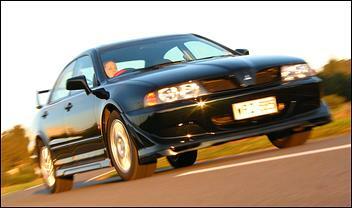 Oh, and forget about throttle-lift oversteer - no Magna is set up for that. No question - manual or auto, the Ralliart Magna is shatteringly fast. These performance figures don't tell the true real-world driving story, though, because the Ralliart engine is as punchy as any mass-produced engine you'd care to mention. Throttle response in the auto model is excellent (though not as unbelievably sharp as the manual) and there's ample torque available at absolutely all revs - the lack of torque converter flare tells that story. At idle, however, the tuned 3.5 is oh-so slightly throbbier and the idle speed in Drive has been increased to 680 rpm (compared to 625 rpm in the auto VR-X). So now let's take a closer look at the pearl under the bonnet. The 3.5-litre SOHC 24-valve V6 - drawn from the rest of the Magna/Verada range - is reworked with a few traditional-style tweaks. The camshafts offer 10 percent more lift (and their associated valve springs are upgraded), there're improved cylinder heads, a high-flow exhaust with new stainless headers, revised ECU mapping and the compression ratio has been upped to 9.4:1 - a modest amount that still allows the use of normal unleaded fuel, rather than expensive high-octane premium. At the end of its tuning process, the Ralliart engine is rated at 180kW at 5500 rpm and 333Nm of torque at 4000 rpm - and these are genuine no-fudge figures. To go with these impressive power and performance figures, the auto Ralliart Magna is also reasonably fuel efficient - we recorded around 12.5 litres of ULP per 100 kilometres during our test. Oh, and while we're there, we should also mention that the Ralliart Magna uses a specially baffled fuel tank to ensure adequate fuel flow while it's being thrown around. The Magna VR-X/Sports suspension carries over to the Ralliart edition, the only change being the fitment of custom-tuned Koni dampers. These new dampers provide increased bump and rebound damping forces, with an acceptable trade-off to ride quality. Only over severe potholes will the Ralliart wake you up and remind you you're driving a true sports-sedan. The steering, too, is a case of revising an existing arrangement. The standard Magna's power rack-and-pinion arrangement is altered to deliver different assistance and improved response at high speed. This amounts to definite improvement over lesser model Magnas but, still, the slightly indirect lack of feel at the straight-ahead position remains. While the Ralliart Magna will rip away from a standing start with gusto, it will also pull up powerfully. This impressive braking performance has come through the fitment of 18mm larger ventilated front discs with improved cooling, twin-pot calipers and 26 percent more pad area, working with 26mm larger rear discs (now ventilated instead of the usual Magna's solids) with a stronger calliper body and 32 percent increased pad area. ABS and EBD come as standard, and there's good brake pedal sensitivity. There's no question the Ralliart Magna makes a visual statement - everyone from P-platers to taxi drivers stare (whether in admiration, disgust or sheer curiosity we're not sure!). 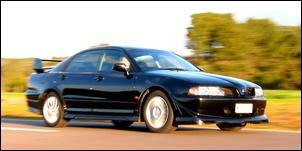 As a package, the body kit adds 'visual weight' to the body, but it is balanced in most areas. 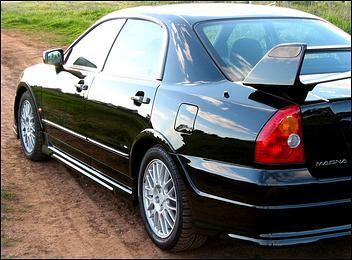 The front and rear spoilers are equally huge, with the Evo Lancer-inspired rear a notable obstruction in the rear-view mirror, while the front proves itself an impractical pain in the backside. We inadvertently damaged both sides of the previous test Ralliart Magna's front spoiler and this car arrived in our hands with cracks already featured - its low ground clearance obviously makes it very prone to damage. However we're told the production bumpers are moulded thicker through the 'gill' area than they were in these early-run cars, and - if need-be - the lower lip can always be detached. 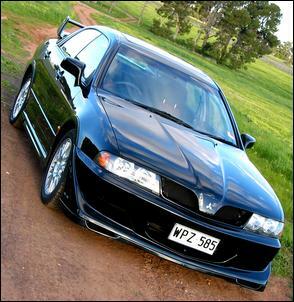 This is a similar concept to that used on the Holden/HSV VL Group A Walkinshaw all those years ago. Under each of its add-on flared guards, the Ralliart parades 17 x 7-inch Enkei cast alloys wearing the aforementioned 225/50 Pirelli P6000 rubbers. Body colours are limited - there's the choice of Flame red, Mawson white, Pewter silver or Sable black (as seen here). Indoors, the red/black theme initially appears quite raucous but you soon get used to it. The front seats - re-padded and reshaped over the normal Magna seats - offer good comfort and an appropriate amount of side support. 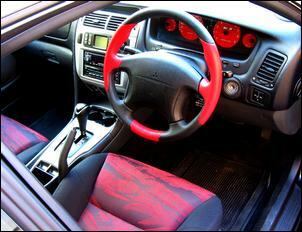 Like the seats, the steering wheel too has been given a new lease on life - the standard Mitsubishi centre is leather wrapped black and red by Momo Italy. As mentioned in our Ralliart manual test, however, drivers with small hands dislike the substantial thickness of the rim. Other eye-catching interior features are the exclusive silver-finish centre console trim and the red-faced instrument dials. Again, slightly gaudy, but you soon get used to them. The Ralliart's audio system has much improved sound quality over lesser model Magnas - whose stereos universally sound pretty bad. The new feature-packed Fujitsu Ten Eclipse system has the capacity for seven CDs and - driving through a total 14 speakers - puts out good treble, mid-range and bass. 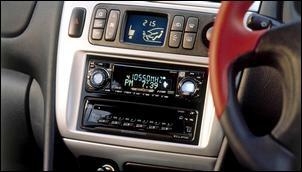 But the double-DIN head unit does lack a dimming function for nighttime driving. Other than that, features are pretty much as you'll find in the VR-X. There's digital climate control, dual front airbags, power windows and mirrors, cruise control, electric antenna, LED gear position indicator and the usual Magna barrel-style odometer is replaced with an LCD screen in the instrument cluster. This also doubles as the trip computer display, which has been moved away from the screen just above the centre air vents. Security extends to a remote central locking system with an alarm/immobiliser as well as Data Dots. The only option is an electric tilt'n'slide glass sunroof, which adds $1890 to the $48,990 list price of the vehicle. Note that both the manual and auto Ralliart Magnas retail for exactly the same price. So what've we got in the Ralliart Magna AT? Well, we're pleased to say - despite being a tad slower overall - it's a car that behaves with a huge amount more refinement than its manual cousin. It's certainly the car we'd much rather be driving on a day-to-day basis. And compared to its opposition, the Mitsi strides over the line a clear winner - the supercharged 3.8-litre V6 from Holden/HSV, for example, is absolutely light-years behind in NVH and performance levels. Aside from its limited absolute level of traction and its impractical front spoiler there's nothing substantial to criticise on the Ralliart Magna AT. We can certainly appreciate why Mitsubishi felt the auto version would be different enough to justify another road test - the difference over the manual is unbelievable. 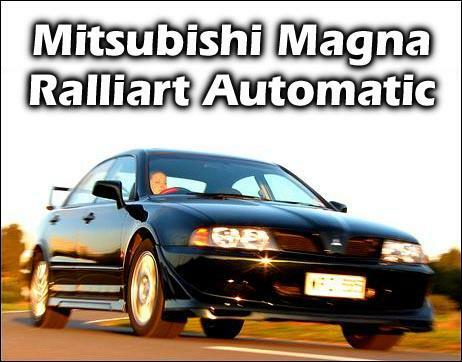 The Ralliart Magna Automatic was provided for this test by Mitsubishi Motors Australia.